Sonnet Designs: Time For A Celebration! It's definitely a celebration whenever you use a Kenny K image. Don 't you love the attitude of his characters? I just love their sassiness. I've also chosen brown and blue for the main colors for this card,with a splash of mustard yellow. It's a different combination and really caught my eye. I used copics to color the image: C0, E31,33,35,50,53,57,59, BG32,34, and B01. I added some gorgeous flowers that I got from Wild Orchid Crafts. I used a MFT flourishes die for the flourish accent. 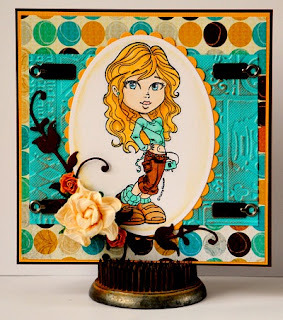 I added four metal embellishments that I had in my stash, and I embossed the blue paper using a TH folder. Yes! She is a bit sassy! I love your coloring it is fabulous! Thanks for joining us this week at KKKG's challenge! Good luck and I hope we see your lovely work next week! Gorgeous creation! Thanks for joining KKKG this week! Yes, I love the sassiness of the KK stamps! Perfect color combo for her! Your embellies are awesome! What a beautifull card!!! Thanks for joining us at KennyK's challenge!! Gorgeous ! What a fantastic card. Thanks for joining us at WOC this week. I love his characters, they are so sassy and cool and a blast to color! Great job with this one.